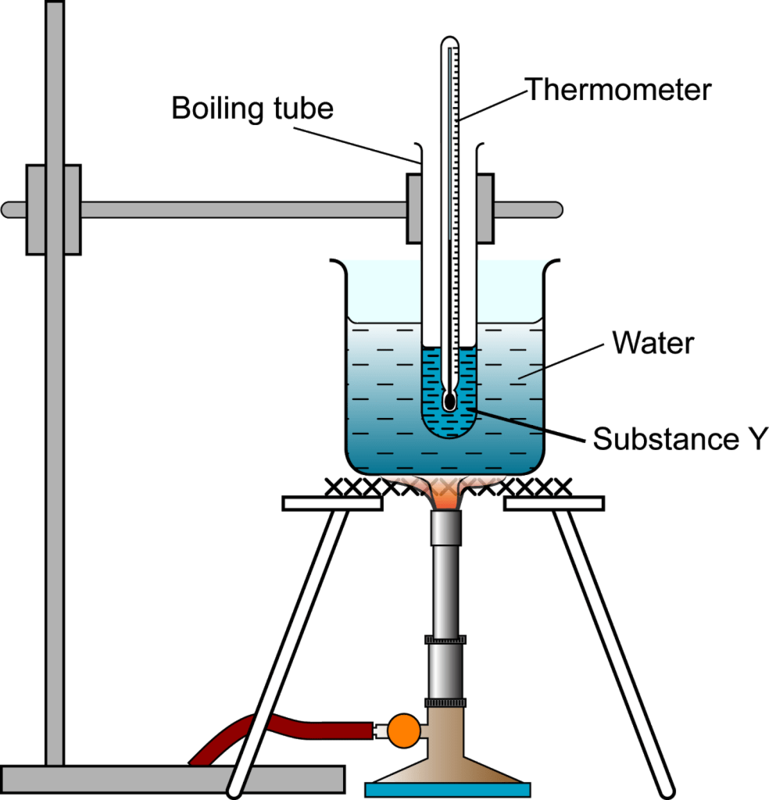 Figure (a) shows the set-up of the apparatus to investigate the heating process of substance Y. In this experiment, solid substance Y was heated in a water bath from room temperature until it turned into gas. Substance Y was stirred throughout the whole experiment. 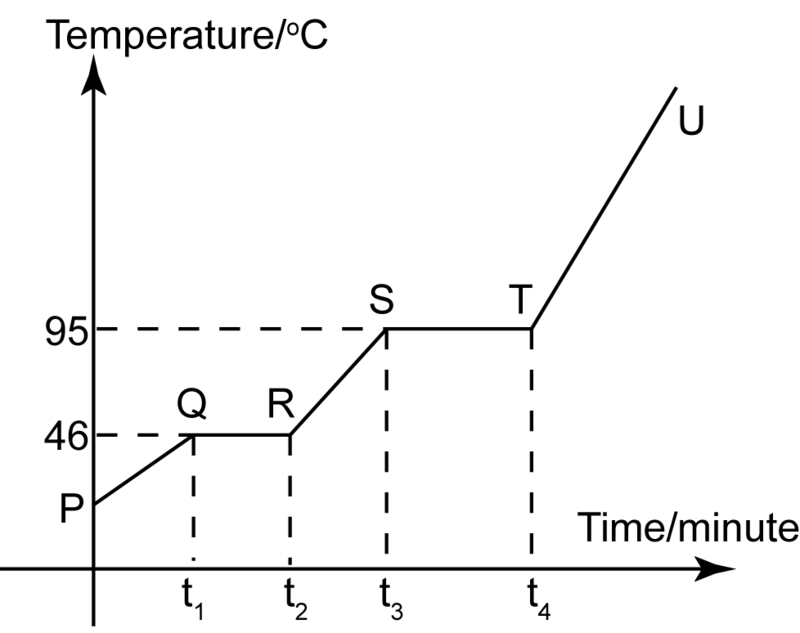 The temperature of substance Y was recorded at fixed intervals of time and the graph of temperature against time during the heating of substance Y is shown in Figure (b) above. Why the temperature of M remains unchanged from time t3 to t2 even though heating continues? From t1 to t2, substance Y is melting. The heat supply to the substance is used to overcome the strong attraction force between the solid particles. No heat energy is used to increase the kinetic energy (temperature) of the particles. Give a reason why water bath is suitable in this experiment?Because the melting point and boiling point of substance Y is lower than the boiling point of water. Name 2 substance, whose boiling point can be determined by using water bath. Given that the boiling point of substance X is around 105°C. Why can’t we use water bath to determine the boiling point of substance Y?The boiling point of water is 100°C, which means the maximum temperature that can be achieved by water is 100°C, which is lower than the boiling point of substance-X. Substance X can not be boiled by using water bath. Suggest another method which can replace water bath in this experiment.Use oil bath or sand bath instead of water bath. Why stirring of substance Y is required throughout the whole experiment?So that heat is spread evenly throughout the substance. Compare the kinetic energy of particles of substance Y at t1 and t3.The kinetic energy of particles at t3 is higher than the kinetic energy of particles at t1. State one different in the arrangement of the particles of substance Y before t1 and after t4.Before t1, particles are arrange in an orderly manner and close to one another. After t4, the particles are very far apart and randomly arrange.